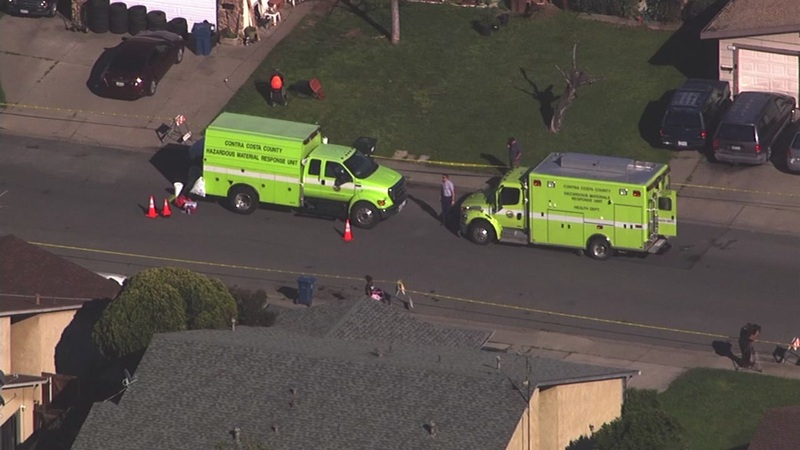 ANTIOCH, Calif. (KGO) -- Hazmat crews are working to clean up six to seven areas on Manzanita Way in Antioch after they were reportedly contaminated with mercury. Contra Costa County hazmat said the received a call around 10:15 a.m. about mercury underneath a man's motorcycle trailer. Hazmat responded and started to clean up to the mercury when they looked and noticed there was mercury in other locations. There are currently six to seven areas contaminated with mercury, according to Contra Costa hazmat. No shelter-in-place was issued, but Manzanita is closed down to help stop the spread of contamination. An EPA spokesperson said that someone may have inadvertently thrown out the mercury with the trash and it spilled. There is no estimated time of reopening and USEPA is helping with the clean up.